There’s this one multisport shop that always amazes me everytime I set foot in it. Apart from it’s jaw-dropping gears for sale, and its cafe’s truly delish food and coffee, there is always something new to discover and appreciate. I was there last Thursday and walked right swak into a shop decked with art on exhibit! You just gotta love the Maximus Athlete Shop Cafe, it is more than just a shop and cafe! Currently on-going until December 12 is the Base Camp Art Exhibit where several young artists expressed their take on multisport and the athletes through various forms of art. The exhibit was conceptualized and being held in partnership between Maximus and Tin-aw Art Gallery. Don’t just take my word for it, swing by and see for yourself! If you are lucky, you might be able to still score a few art pieces as when I was there, a lot have been sold already. The premier cycle cafe proudly unveils “Base Camp”, a collaborative venue with Tin-aw Art Gallery. A merging of art and athleticism, “Base Camp” brings together twenty-two (22) young artists to express their views on the life of the athlete, the physical body movement using their medium of choice. The artists include: Ambie Abaño, Renato Barja Jr., Mars Bugaoan, Lennard Buhay, Ian Cadiong, Francis Commeyne, Cian Dayrit, Anton Del Castillo, Gale Encarnacion, Carzen Esprela, Gab Ferrer, Lui Gonzales, Lofranco, Henrielle Pagkaliwangan, Lee Paje, Julio San Jose, Jun-jun Sta. Ana, Nicole Tee, Clairelynn Uy, Eunice Vergara, Jemime Yabes. “Base Camp” is the first of what is hoped to be a series of exhibitions between Maximus and Tin-aw, as the two see a vibrant world that can be expressed both through sport and art. “More than finishing times or medals, sport allows a person to express his physicality, his grit, his soul in the competitive arena. Yet art is just another way of expressing this aspect of living. With ‘Base Camp’, we want to be known as more than just a café or sports shop. We are about the passion for living, which you can experience on a bicycle, on the trail, and through this show that Tin-aw has curated for us.” says Maximus’ director, Andy Leuterio. MANILA, Philippines – In an effort to raise awareness and reduce the stigma of breast cancer through proper education and healthy lifestyle, Under Armour held an event last October 29 at Edsa Shangri-La Health Club in Mandaluyong City to spearhead the UA Women: Empowering Other Women campaign. The event highlighted an intense circuit training as well as a health fitness symposium, conducted by Under Armour-affiliate trainer Kat Geronimo. Geronimo, who is fondly referred to as “Mama Kat,” is a renowned celebrity fitness mentor in the country as she coaches notable film and television actresses such as Marian Rivera, Danica Sotto-Pingris, Melissa Ricks, Megan Young, Bettina Carlos, Anne Curtis and Jessy Mendiola. As a special treat, Mendiola was in attendance to participate in Geronimo’s session and extend her utmost support to Under Armour’s UA Women: Empowering Other Women campaign. Mendiola has been tapped to be on the cover of numerous magazines and was recently hailed as the “Sexiest Woman in the Philippines” for 2016 by FHM. The 23-year-old actress is also known for having an active lifestyle, engaging in different exciting workouts from mixed martial arts to callisthenic exercises. Aside from the activities, the event likewise featured the sports apparel’s highly-regarded Armour Crossback Bra, which is tailor-made for females with a dynamic everyday routine. The Armour Crossback Bra has the super-smooth, double-layer HeatGear® fabric that delivers superior next-to-skin feel as well as the Signature Moisture Transport System that wicks sweat to keep the user dry and light. Also make sure to follow Under Armour Philippines via @underarmourph on Instagram and Twitter as well as Facebook at http://www.facebook.com/underarmoursea. It’s back! The Music Run™, the ultimate 5k running and music festival is back in Manila for its second incarnation this year! 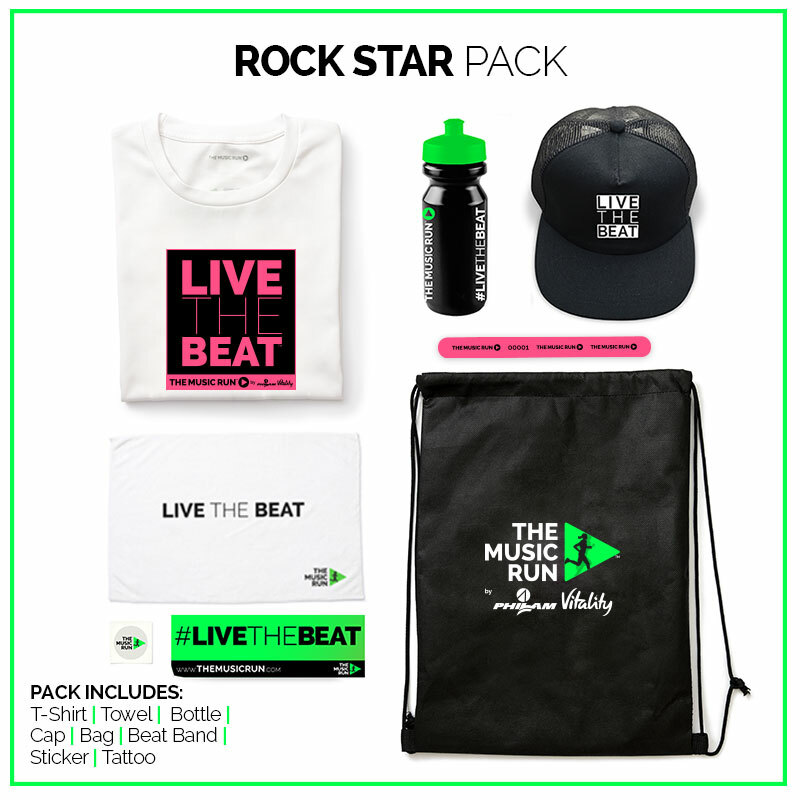 For music lovers, casual runners and fun seekers, The Music Run™ is more like a party than a run – it is the only 5km fun run that puts music at the heart. It empowers participants to control the soundtrack of the run by voting for their favorite songs in the build up to the Event. Voting is via a bespoke ‘Music Voting App’ and the songs with the most votes make the official run playlist. On event day runners experience the world’s loudest 5k running course, known as ‘The Sound Track’. Over 120 speakers pump out the songs participants voted for across 5 interactive and music themed zones. The run ends with the ultimate after-run music festival. With music every step of the way, running never sounded so good! It is mandatory for all participants to collect their event packs on the dates stated above. There is no event pack collection after 28th November. You may authorize a representative to collect the event pack on your behalf if you are unable to do so. MANILA, PHILIPPINES— The ultimate 5k running and music festival drew nearly ten thousand runners when it first made waves in the Philippines last year. This year, The Music Run™ by Philam Vitality returns to amp up an equally large—or even larger—crowd with everyone’s favorite hits playing on 120 concert-quality speakers across McKinley West in Taguig City. 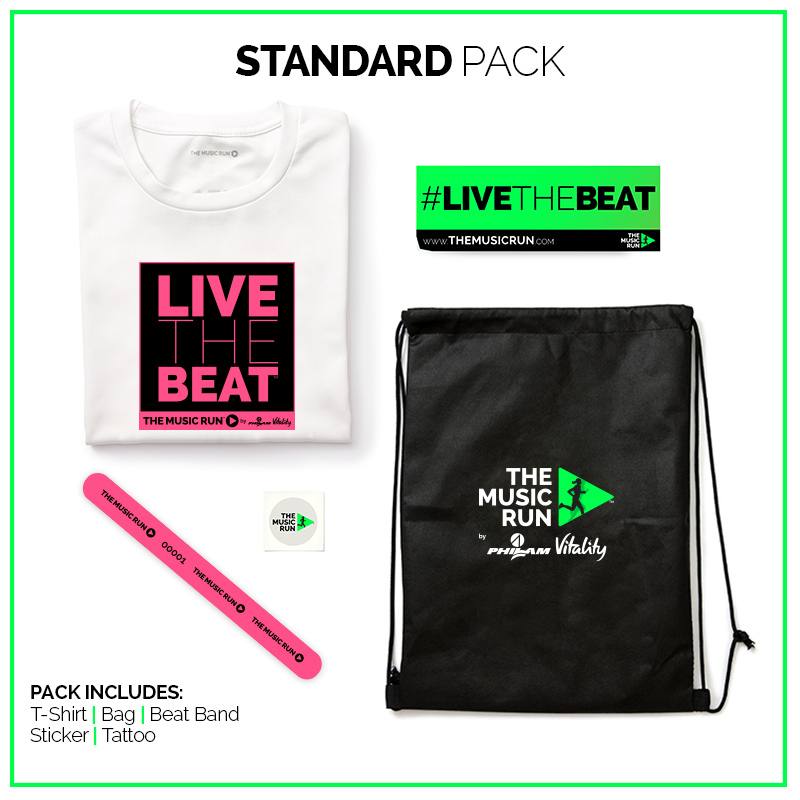 In partnership with music streaming service Spotify, The Music Run™ by Philam Vitality will rock Manila on December 3. Last call for registration is on November 25. The five-kilometer run will include five music-themed zones playing rock, pop, old school, hip hop, and dance. Using the live Spotify Music Voting App on http://www.themusicrun.com.ph, participants can vote up to five songs per playlist every day to build the official soundtrack for each zone. Late registration for The Music Run™by Philam Vitality starts on November 1. Standard and Rock Star Packs for late registrants are priced at P950 and P1,600respectively. Children less than five years old can join the run for free. 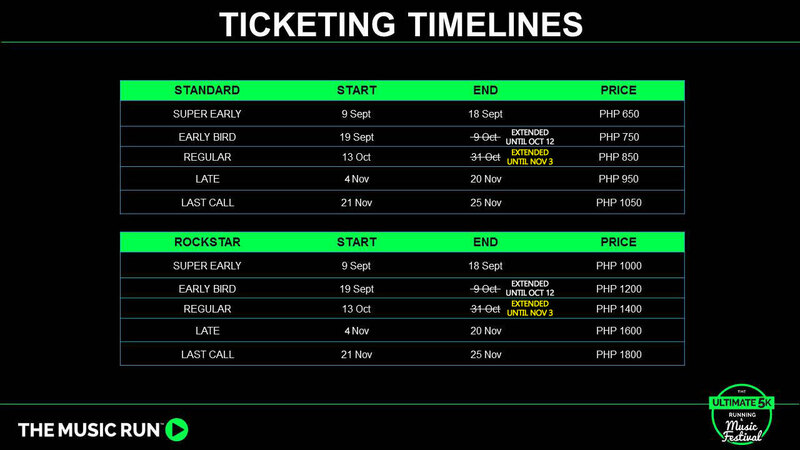 For last call registrations starting on November 21, the Standard and Rock Star Packs will cost P1,050 and P1,800 respectively. Mizuno’s Newest Wave Sayonara 4 NOW OUT! Mizuno’s newest version of their Wave Sayonara shoe line, the WAVE SAYONARA 4, is now available in the market and here is the official word from Mizuno about this shoe model, read on! Mizuno’s dedication to provide innovative products is the soul of the company’s motto to Never Settle. The latest in Mizuno performance shoes now has its best upgrade. Mizuno has blurred the lines between race day and everyday training in this performance, neutral shoe. With a sleek fit and low-profile midsole, this lightweight,responsive shoe is perfect to go fast. The Wave Sayonara 4 is best for the competitive runner who wants a lightweight shoe that can bring their performance to the next level of running experience. The dynamic feel and updated cushioning will make you want to run fast and run endlessly. The U4ic midsole and blown rubber in the forefoot makes a lightweight structure that is combined with Mizuno Dynamotion Fit technology that provides a unique running experience. The new version features a 10mm drop from heel to toe is expected to be lighter than it looks, while X10 rubber on the outsole also provides for longer lasting traction. The upper design features a functional aesthetic when it comes to the secure fit of the shoe with the 3D printed lines on the lateral an medial side of the shoes, combined with the stitched in logo, and a toe guard to avoid water from accumulating in the forefoot area. If you are looking for a pair of racing shoes that will get you through training and race day, then the Wave Sayonara 4 is the perfect partner to lace-up with and take you through further distances. Marathon’s will become your new best friend.